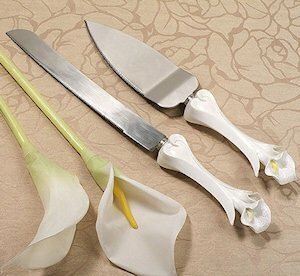 A stunning, single calla lily forms the handle of each piece in this wedding serving set for cake. 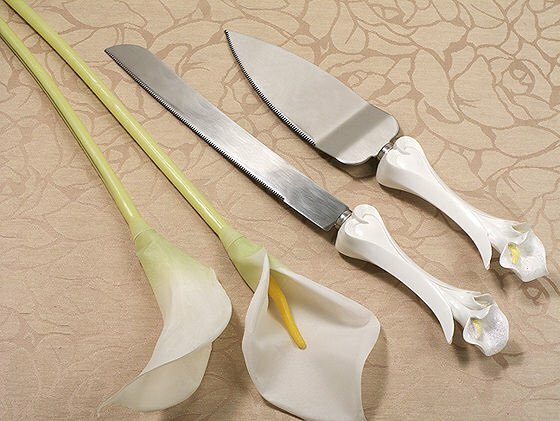 The delightful ensemble includes a stainless steel cake knife (12 1/2") and stainless steel cake server (10 1/2"). The two pieces are packaged in a gift box. The handles are crafted of fine white resin and feature a classic heart shape in the design which will be appropriate each year that you celebrate your wedding anniversary.